This year there was a real attempt to extend eastwards, way beyond the area around the Haus der Festspiele, in particular with a focus on Kreuzberg, where the Festival put on two nights at Club Lido. There were good reports of the first of the nights, with Shabaka and the Elders and I went to the second night, at which I enjoyed the way the set by Steve Lehman’s Selebeyone evolved (review here). Another innovation was to take the pop-up gig model that Empirical have developed in the UK. The quartet spent three afternoons performing in the new Alexa shopping mall very close to Alexanderplatz and that Berlin icon the Funkturm (radio tower). They had also appeared at a major festival function. It was in a retail unit slightly away from the main footfall of the centre, but people had clearly found their way to it, and when I went it was definitely standing room only. Empirical are that most unfazed of bands, but they always deliver huge energy and commitment to the music to each other and to the audience. The Thursday night started with a set from Artist-in-Residence (another first) Tyshawn Sorey’s trio. Taking the Spiegel theme of trying to reach out to two kinds of audience, this was an uncompromising one, definitely aimed to appeal to the more austere section of the audience. Tyshawn Sorey dominated with the larger percussion normally associated with big symphony orchestras - a huge gran cassa and a massive tam-tam - but some people in the audience were losing patience, and to have the near-silence punctured by a mobile phone certainly didn't help. The second half was a suite from the NDR Big Band and a new work Geir Lysne, where the attention was grabbed by Solveig Slettahjell’s impassioned vocals and Eivind Aarset’s spacious guitar-plus-electronics effects, but the whole was somehow less than the parts. I was involved as pre-performance announcer for the international launch of Monica Vasconcelos’ Sao Paulo Tapes album. I am possibly disqualified from comment, but these songs from the period of the dictatorship in Brazil are just great songs, the addition of guest Ingrid Laubrock brought her assuredness and measured thoughtful playing, Yaron Stavi and Laubrock gave affecting readings of song texts, and one extended piano introduction by Steve Lodder near the end was just phenomenal. (Monica explains the background in this interview). The Friday session opened with a prizegiving. One of Germany's main - and most transparent - national prizes for musicians is the Albert Mangelsdorff prize. The winner was Angelica Niescier. She preferred to play than to speak. Wise move, because the layers of protocol already involved five speakers, the first of whom was Richard Williams. He was asked to speak because it was deemed appropriate to “welcome the prize to its new house” - i.e. into the main theatre - in his role as “Herr des Hauses”. That felt like cue-ing the opening of Wagner’s Lohengrin. I went to two events on the Friday. The opening slot was taken with great assurance by pianist Michael Wollny. He is a major figure in Germany, but he appeared genuinely grateful, even surprised, to have been given the honour of performing solo in the main hall of the festival. He is experienced at the art of building a solo set and it worked well. His main improvisation built to a climax of fast tremolando in both hands, sustain pedal down, and using the natural resonances of the Steinway to great effect. And he did well tto move away from abstraction and busy-ness to reel in the audience with his improvisation on Schubert’s Die Nebensonnen from Winterreise, and in particular in Rautavaara's Cantus Articus, a calm and very fitting encore which received ecstatic applause. 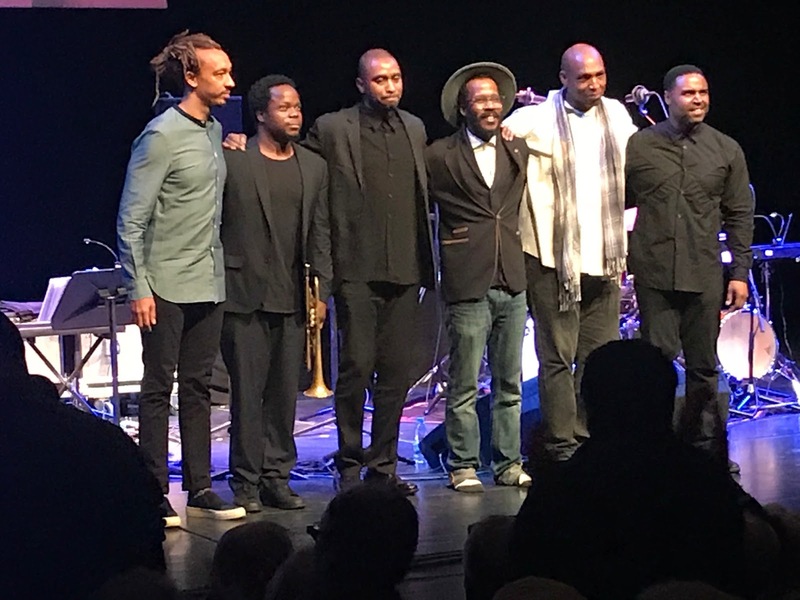 My highlight was the premiere which followed, a new work from Ambrose Akinmusire using 1930’s field recordings of an astonishing singer Mattie Mae Thomas, recorded in a Mississippi penitentiary. It was slow-paced, atmospheric. The complications of using these recordings while performing new music for the first time on live radio may have explained a certain reticence, and it is quite likely that there will be more settled, more outgoing performances, but the music is well-crafted and has a very poignant undertow. ADDENDUM: The final word comes from the Festival's wrap-up press release. The spokesperson for the "Gremium" or committee of ARD producers Arne Schumacher expressed the sentiment from the broadcasters' perspective as follows: "The exciting and extraordinarily multi-layered last festival edition of Richard Williams was all about improvisational exchange, new collaborations and bridge-building. The two-day start at the Lido in Kreuzberg has proved its worth and set a fresh tone. 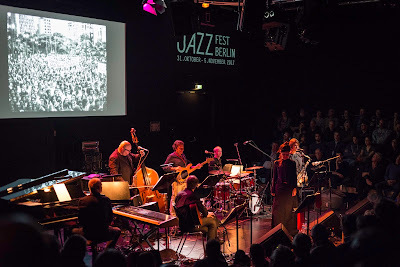 The live broadcasts went off without a hitch, the long ARD Jazznacht was packed with attractive excerpts from live recordings, interesting conversations and contributions. We would like to thank Richard Williams for three musically inspiring years and an open, intensive and thoroughly stimulating exchange of ideas." Next year's Festival Director will be Nadin Deventer. Dates 1-4 November 2018.